Market sentiment. Remaining nervous. Was the fourth quarter sell-off a late cycle squall, that will correct itself? Probably. Or despite the recovery rally seen in early January, does it herald the onset of a bear market? Probably not. We will learn this year what the 13.3% fall on the MSCI World Index (in dollars) over those three months signified. But the underlying health of the U.S and global economy suggests global stock markets offer value at current multiples and will generate positive returns in 2019. JP Morgan Asset Management calculates that forward price earnings multiples on all major stock markets at the end of December – including the U.S- were below the average since 1990. The U.K and Japan, substantially so. Market weakness sits oddly with generally good global growth data. What is apparent is that there has been a dislocation between underlying economic growth and corporate earnings, which are both generally good, and investor appetite for risk assets - which is weakening. Indeed, investor nervousness has spread into the banking sector, where three-month dollar LIBOR rates ended December at 2.8%, the highest rate since the dark days of November 2008. The contradiction is easily explainable, it is being driven by Fed policy. 2018 was the first year in which we saw the Fed reverse its quantitative easing programs, through destroying $50 bn a month of interest and capital repayments being received on its bond holdings. This, together with a well-announced program of interest rate hikes, is testing investor’s faith in the Fed’s ability to ‘normalise’ U.S monetary policy without tipping the economy into recession. And yet the U.S economy, while now growing at a slower pace than in the summer of 2018, is headed for perhaps 2.3% GDP growth against the 2.5% of 2018 according to the December forecasts from the Fed. The one-off tax cuts of December 2017 that gave such a boost to U.S disposable income last year will not be repeated, but unemployment -already at a multi-decade low- looks set to fall still further, which will support consumer spending. The Fed can reverse course. The important thing to remember is that, should the U.S economy falter significantly (and the market bears be proved right), the Fed will have room to reverse the policy. Inflation is modest, at 2.4% using the Fed’s preferred measure (the PCE). Fed chair Jay Powell has made it clear in recent weeks that the central bank will be flexible in its approach. This has been treated by the market as a sign that interest rates may peak in the current cycle, at a lower level than forecast in September. Indeed, those who fret over other central banks also tightening monetary policy too soon forget that the ECB and the Bank of Japan can also reverse course and increase their monthly asset purchases. Treasury bond yields have fallen in response to Powell’s more conciliatory remarks, so increasing the relative attractiveness of dividend-paying, defensive stocks. A trend that is likely to persist in 2019 as investors continue to fight shy of riskier asses that are subject to the greatest volatility, rediscover dull but worthy value stocks with good dividend cover. Hence my belief that we are not facing the start of a bear market. However, a full-throttle risk on approach is clearly not suitable either given expectations of continued risk aversion and volatility by investors. The only ‘winning’ investment strategy would be a multi-asset portfolio, that includes equities, bonds, property, and alternatives. 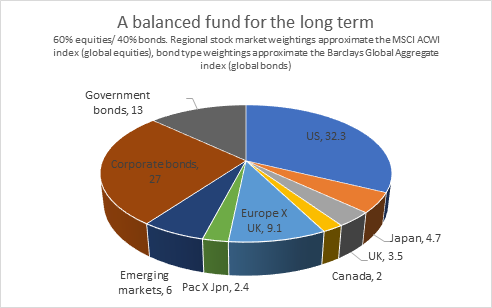 Financial history suggests such a mix will deliver better risk-adjusted returns, over a number of economic cycles, than any one asset class. Risks. The biggest risk is of a eurozone recession and bank crisis, with a lack of political leadership now that Angela Merkle is in declining influence in Germany, and so amongst other eurozone leaders. The region a sharp downturn in third quarter GDP, to 1.6% on a year-on-year basis, but only 0.6% growth at an annualised rate. Germany suffered a slight contraction in aggregate demand over the period, thanks in part to the weak auto sector. Data released in recent weeks suggests the fourth quarter did not see a pickup in eurozone demand, making it a poor outlook for 2019. However this is not necessarily a ‘sell’ sign for the region’s stock markets. After a decade of underperformance, disappointment may be already baked into eurozone share prices. The U.S/ China trade war is increasingly focusing around technology and China’s industrial policy. Some of the issues will be insurmountable, for example, China will not want to abandon its lead in 5G internet technology under any circumstances. But with China’s economy already slowing before the full effects of the stalled tariffs are felt, Beijing will want a deal. As do western companies who trade with China. U.S/ China relations are prickly, and beneath the American’s accusations of unfair trade lurks a real fear that China is stealing its technology in order to supersede the U.S as the foremost global power. In the U.K a no-deal Brexit looms. This is not a choice that the government, or members of parliament, will vote for. If it happens, it will be by default because Parliament has failed to vote through an agreement with the E.U on the U.K’s future political and trading relationship with the E.U. It is not just that there is no majority in Parliament for Theresa May’s Brexit deal (a vote is due on 11th January), but there is no majority for any form of agreement with the E.U. A no-deal Brexit will probably be chaotic for the country in the near term, pulling the U.K into recession. Longer-term rushed trade deals with the U.S and the E.U, on generally poor terms to the U.K, will restore growth to the economy. Sterling will weaken. However, FTSE 100 stocks will benefit from a weaker pound since most of their earnings are from abroad. It will be smaller, domestic focused stocks that are worst hit.